Why a Software Development Technician Firebrand Apprenticeship? What is a Software Development Technician Firebrand Apprenticeship? Software Development Technician apprentices are taught how to design, install, maintain and support communication networks within an organisation or between multiple organisations. They'll understand network configuration and administration, the cloud and monitoring tools; and be able to give technical advice and guidance. Demonstrate competence against two knowledge modules: Software Development Context and Methodologies and Programming. These are assessed by examinations set by the British Computer Society and regulated by Ofqual. Apprentices must pass both modules. Successful Software Development Technician apprentices go on into roles such as Network Technician, Network Engineer, Systems Engineer, Network Administrator. Apprentices will achieve two BCS qualifications. What are the benefits of a Software Development Technician apprenticeship? Understand how to implement code, following a logical approach. Understand how code integrates into the wider project. Understand how to follow a set of functional and non-functional requirements. Understand the end-user context for the software development activity. Appreciate the importance of seamlessly connecting applications to databases and understand types of data storage and their applications. Demonstrate knowledge of database normalisation. >Understand why there is a need to follow good coding practices. Understand the principles of good interface design. Understand the importance of building security in to software at the development stage. Additional courses are delivered when apprentices have submitted evidence to the End Point Assessment gateway. There are some course combinations for this programme which mean you can select more than one course - we'll discuss this with employers on a case-by-case basis. When do Software Development Technician apprentices train? Who can enroll on a Software Development Technician apprenticeship? How much does a Software Development Technician apprenticeship cost? The total cost of this apprenticeship programme is £15,000. How much you pay as an employer will depend on whether your business pays into the Apprenticeship Levy. 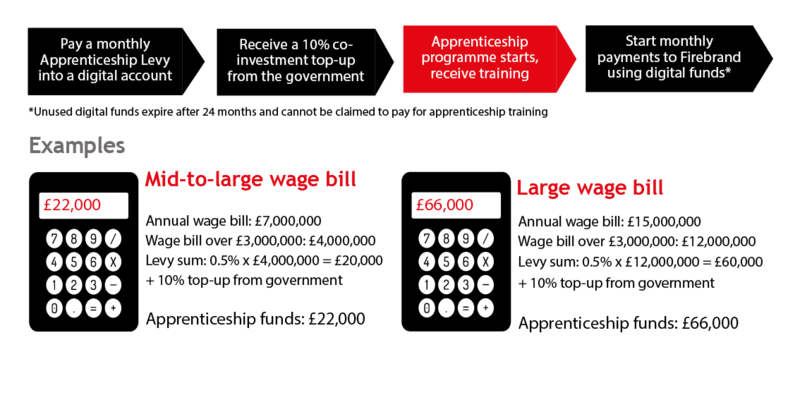 Read below for to learn more about how apprenticeships are paid for. How are Software Development Technician apprentices assessed? What does an Software Development Technician apprentice's journey look like? How do Digital Marketer apprentices progress?